Buzick Ranch, one mile south of Sylvan Grove, KS. "This field of barley is irrigated with water pumped from Saline River. Silo in background is filled with Atlas Sorghum produced under irrigation on this field. After this barley crop is harvested, field will be leveled and planted to alfalfa." 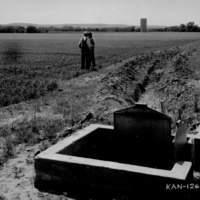 B.C.McLean, Soil Conservation Service, “Buzick Ranch,” Recollections Kansas, accessed April 21, 2019, http://recollectionsks.org/items/show/796.